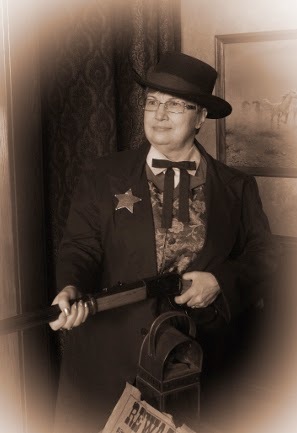 Diane L. Goeres-Gardner makes readers eyewitnesses to frontier justice in Necktie Parties: Legal Executions in Oregon, 1851~1905. This book details the history of Oregon’s hangings during this time period. Each chapter concentrates on a single case and the circumstances surrounding it. Today, capital punishment is a controversial topic, in the United States, and around the world. That wasn’t the case during the 1800s on America’s western frontier. Executions were public events drawing hundreds – sometimes thousands – of residents from miles around. Parents often brought their children, believing the youngsters should learn what happened to people who chose the wrong paths in life. Goeres-Gardner also looks at the backgrounds of the condemned and their victims, the crimes and the investigations. The author uses trial records, witness testimony, newspaper reports, and other historical records to bring to life each of the more than fifty cases included in Necktie Parties: Legal Executions in Oregon, 1851~1905. These stories give fascinating glimpses into frontier justice, early American justice reform, and jury selection techniques. Facts are footnoted and each story is thoroughly referenced. Necktie Parties: Legal Executions in Oregon, 1851~1905 will be a valuable addition to any library and a great read for all curious readers. 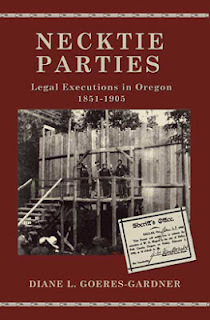 Necktie Parties: Legal Executions in Oregon, 1851~1905 is published by Caxton Press. "Welcome to the world of frontier justice. Necktie Parties records, in chronological order, the individual stories of the men who climbed the gallows steps and faced the hangmans' noose. Oregon's history of hangings during the nineteenth century is a history of ordinary people who committed extraordinary acts. In many cases, the condemned enjoyed their notoriety, at least up to the moment the rope was tightened around their necks." So begins the first page of Necktie Parties. The book contains fifty separate stories, separated into three sections: "Open to the public, 1851-1866," "Modern Inventions Improve Executions, 1896-1905," and "Sensational Journalism Takes Control 1896-1905." Each story includes the names of the individuals involved: judges, lawyers, jury members, witnesses, and family members. Endnotes, references, and an index are included in the book. There are 45 photographs/illustrations throughout the book, including copies of six hanging invitations and seven rare photos of the condemned standing on the gallows. "On May 25, 1860 George mounted the scaffold and bravely faced from 1500 to 2000 spectators who had gathered to hear his dying speech. Just as he finished declaring his innocence in very broken English with a heavy German accent and stepped forward to face his death, Sheriff Sheldon B. Fargo made a surprise announcement. Governor John Whiteaker had refused to sign a petition commuting George's sentence to life imprisonment, but did grant him a thirty-day reprieve - enough time for his relatives to say their farewells. Unfortunately, the reprieve still needed to be signed by the Secretary of State, Lucien Heath, in Salem - a round trip of 65 miles from Corvallis, or six hours of hard horseback riding. Unwilling to make the decision on his own whether to honor the not-quite-legal reprieve or to ignore it and hang George anyway, the sheriff asked the audience to vote. It must have been an excruciating few minutes as the condemned man listened to people delaying his fate. Instead of going forward with the hanging, human compassion prevailed and George was taken back to jail." "When Multnomah County Sheriff Ben Norden and his deputies led Ah Lee outside, the huge crowd shoved and jostled them. Printed invitations had been issued but the guards at the entrance of the stockade refused to intervene and the crowd rushed inside the small enclosure. Rude epitaphs and vulgar comments were hurled at the prisoner while his guards tried to push their way through the crowd. They finally reached the scaffold and took refuge on top. Above them the crowd was so thick on the balcony, the beams cracked and moaned." "Two weeks later, during a conversation with Peter Svensen, he described what happened that day. Svensen reported what Hansen told him. "There was a club lying there that was to change the calf in the pasture and he took that club and hit his wife in the head. He said she was standing there picking berries at the time. I asked him if he had any cause for it and he said he had no cause whatever, and he didn't know at that minute what he done it for, but he said he done it and he didn't hardly know how it happened himself at the time." "The press' influence was felt all over Oregon. Another young man living near Beaver Creek in Benton County resided with his father, two sisters and a brother-in-law. After reading the accounts of Lloyd Montgomery's murders he told everyone that he agreed with Montgomery's actions and thought it was a great thing Lloyd had done. One day there was some trouble in the family and the youth jumped up from the dinner table, seized a Winchester rifle and threatened to kill the whole family. 'I will make another Lloyd Montgomery affair,' he shouted with such emphasis that a stranger, who happened to be in the house at the time, became frightened and left." "The most learned professors on the west coast scientifically examined the dead men's brains. They believed that the development of the gray matter rather than its gross weight indicated the amount of intellectual ability. Dalton's brain weighed 46 ounces and Wade's brain weighed 53-3/4 ounces. The doctors explained that while Wade's brain was a few ounces over the average and Dalton's was considerably less, that did not mean that Wade was more intelligent. Both men were buried in the Multnomah County Poor Farm Cemetery." "Ms. Goeres-Gardner has presented an impressively researched and meticulously documented examination of the history of legal executions in Oregon from the beginning of the territorial period until the time when executions were moved to the state penitentiary in Salem. Her narratives of the fifty executed men, their crimes, their defenses and the stray details of late 19th century life that peek out at the reader through court sources make for a fascinating story. Whether it is the condemned man who feigned catatonia for 515 days or the medical doctors who measured the deceased brains to test theories regarding intellectual capacity of the defendant, the characters come alive with all their foibles, fears and petty jealousies which drive the human condition." If you enjoy true crime stories, and if you are curious about Oregon history, you will really appreciate Necktie Parties: A History of Legal Executions in Oregon, 1851-1905.